John D. Barrow was born in New York City in 1824 and spent his early days there. He was from a prosperous Quaker emigrant English family. He recalls moving upstate to Skaneateles in 1839 with his family by boat up the Hudson, then by rail to Utica and by the Erie Canal to Syracuse. He must have seen Skaneateles as the frontier boom town that it was in the late 1830’s although not for long since he was soon shipped out to England to live with cousins at “Elswick Lodge” and finish his formal education in England. There he studied literature and painting and he kept those two passions close for the rest of his life. He returned from England to the village of Skaneateles in the mid 1840’s and stayed for 10 years. He ran a bookstore in town and probably started painting and sketching locally, and possibly studied and was influenced by local artists. There was a substantial art “colony” nearby in Auburn, NY. George L. Clough and Randall Palmer were there. He may have met and been influenced by Charles Loring Elliott at Clough’s studio in Auburn where Elliott was working on portraits. 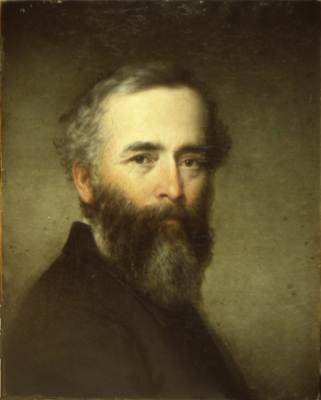 Elliott, the most respected portrait painter after Stuart passed, always had a strong connection to Skaneateles, Syracuse and Auburn. He writes extensively of his outdoor excursions of this ten year period in a short book called Skaneateles Lake published in Syracuse by Grover Press in 1900. He describes camping, rowing, and sailing up and down the lake until he knew its landscapes and moods well. He was friends with William Beauchamp and Edmond Reuel Smith and explored and raced sailboats with them. It sounds like he was a fundamentally different person than his businesslike Quaker parents although his personal accounts and journals have never been found. His father was, among other endeavors, the President of the local bank and Supervisor of the Village. John and his friends studied the lake, its depths, and all the camping areas, points and beaches and ravines of the surrounding hillsides. He said they sketched many of them. He studied geology, botany and astronomy and took these interests into the field. His friend Beauchamp became a serious scholar of the Onondaga Nation and Haudenosaunee Confederacy and learned their language. William M. Beauchamp’s papers are now in the New York State Library. Barrow was the oldest of ten children and never married. In 1856 he decided to become a professional artist in New York City and open a studio there. He made the city his home for the next twenty years but frequently traveled and returned to Skaneateles often in the summers to camp. In New York he was a founding member of the Artist’s Fund Society, and for a while had a studio in the 10th Street Studio Building and knew most of the professional artists and writers of the day. 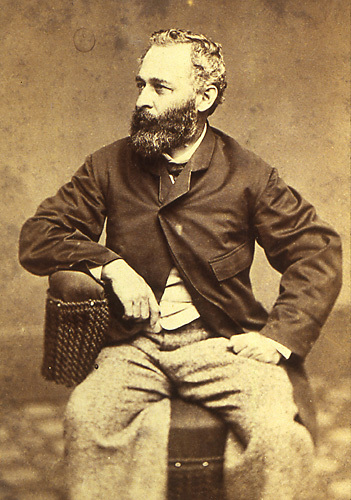 He exhibited at the National Academy of Design from 1861 to 1888 however, for unknown reasons, never became a member. His residence and studio was for years on Lower Broadway 470 and then later at 806 Broadway. 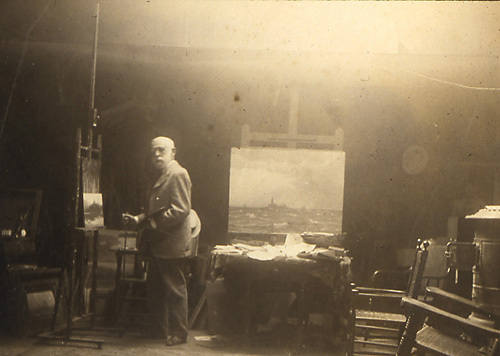 George Inness was a major influence on his work and he met Inness often as they had neighboring studios. Existing paintings show that he traveled to the Adirondacks, White Mountains, Long Island, Appledore Island, Maine, and extensively around Skaneateles Lake and Onondaga County. Called home from New York City in 1876 on the death of his father and the need to manage family affairs he spent the remainder of his life in Skaneateles. He painted and studied extensively, was president of the Skaneateles Library Association and a warden of St. James (Episcopal) Church and a member of the Onondaga Historical Association. He remained friends with William Beauchamp and presented papers to the Onondaga Historical Association. Elliott in Skaneateles – A Paper Read Before The OHA Feb. 8th, 1897. Local newspaper accounts show he continued to travel back and forth to New York, but his residence remained here in Skaneateles. Many of his siblings did not live to maturity and those who did left few descendants. By 1955 he and his family were little known or remembered in his home town and the following letter was received at the Skaneateles library by the last direct Barrow descendent, Elizabeth N. Barrow of Trelleborg, Sweden, his niece. “Mr. Barrow not only was satisfied to be an artist. His interests were wide and far afield. He was a skilled geologist, and astronomer, whether by day or night. His love of nature and his ability to communicate it made him a companion to young and old. Each summer he spent a month or two on the East side of Skaneateles Lake about four miles from the head, painting, tapping fossils from rocks; scanning the ground for wild flowers, watching the night skies for newly discovered stars and planets; tracing the course of comets with unfailing interest. His companion on these summer camping visits was usually a fellow painter, Mr. DeCost Smith. Both were experts at making flapjacks. One of Mr. Barrow’s finest portraits was that of Abraham Lincoln, painted from sketches made from life. After Mr. Barrow’s death, this was exhibited every year on Lincoln’s Birthday in one of the 5th Avenue Gallery windows, until its final sale. The owner of the gallery afterward told me that a portrait of Lincoln was almost impossible to sell. At the price asked and paid this was no surprise to me. But Mr. Barrow did not live to know this. He died a day or two before his own gallery in the Skaneateles Library was opened. The hard work he had expended on this gallery proved too much for his weakened body. Yet his death was unexpected for the had been up and about his home, on the corner of State and Academy Streets, all day as usual. The house in which he died had been occupied by his family for fifty years or more. Elizabeth Barrow, Niece, June 1955. John D. Barrow died last Friday morning (Dec. 7) at his home at State and Academy Streets, aged 82 years and 13 days. Mr. Barrow had been indisposed for the past two months but had been confined to the house for about ten days prior to his death. The cause of death was oedemia of the lungs. Up to a comparatively recent period he had been actively at work in his studio painting pictures for the addition to the art gallery of the library that he donated and which will soon be completed. Several years ago Mr. Barrow at his own expense built an annex to the library and donated a magnificent collection of landscapes and portraits from his brush. Mr. Barrow was an artist of no mean ability and being in comfortable circumstances his canvases for the most part were given gratuitously to the public. It may truly be said of Mr. Barrow that he loved art for art’s sake and he found the environment of Skaneateles a rich field for his genius..
Mr. Barrow was also an excellent portrait painter and many of his kinsfolk and townspeople have formed studies for his brush.. He began his career as an artist when about 14 years of age. Born in the city of New York on Nov. 24, 1824, his parents came to Skaneateles in 1839. Young Barrow soon afterward went to England and took up landscape and portrait painting. After remaining for five years in England Mr. Barrow returned to Skaneateles and opened a bookstore. The love of his profession finally gained the mastery of him and in 1856 he opened a studio in New York, which he conducted for twenty years. About thirty years ago he returned to Skaneateles and made his home here since. His studio was situated in the Barrow Block, above H. W. Holton’s drug store. 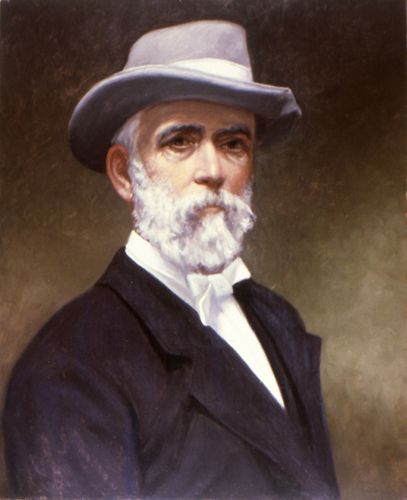 John Barrow was the type of citizen lamentably rare in this commercial age. He was devoted to art, yet he found time to discharge his civil duties, having been a trustee and president of the village, and here again we find the impress of his character strong., resolute, yet broadminded and generous. Perhaps nothing more truly gives a key to Mr. Barrow’s life than this remembrance of his attitude at the time of locating the village fire engine house was before the public. Through his instrumentality the village acquired the site of the old Packwood Carriage Shop, opposite the Packwood House (Sherwood Inn) on the lake front and now a portion of the sightly and beautiful Clift Park. Public sentiment was largely in favor of locating the engine house there, but John Barrow’s love of the beautiful prompted him to stand almost alone against the sordid and selfish influences that insisted upon subordinating beauty and harmony to public utility. An adverse vote of the people and the virulent criticism of the village press failed to swerve him from his purpose. He had the moral courage to brave popular disapproval by insisting upon the engine house being located on its present site and gave largely of his private means to accomplish that end. Even his most bitter opponents have paid tribute to his foresight and wisdom and Skaneateles may well feel grateful that it had a public servant of such force and character and such generous instincts. When funds were being raised for the Soldier’s Monument in Lake View Cemetery Mr. Barrow was a generous contributor and he practically had entire supervision of the erection of the memorial. Mr. Barrow was a Communicant of The Episcopal Church and at the time of his death was senior warden of St. James Church. He was an active member of the Skaneateles Library Association and was president of the institution at the time of his death. He was also a member of the Onondaga County Historical Association and was a charter member of the Artist’s Fund Society of New York City. Mr. Barrow was the eldest of ten children born to John and Elizabeth (Moode) Barrow, but three of whom survive him, George Barrow, the well known attorney from Skaneateles, and two maiden sisters the Misses Rebecca and Elizabeth Barrow, with whom he resided. Mr. Barrow was never married. The funeral services were held at 2:30pm Monday at St. James Church and internment was made at Lake View Cemetery. A number of distinguished and out of town people attended the funeral.